Thank God It’s Friday!! Tomorrow’s Friday!! Happy Friday!! How often we hear each of those refrains over, and over, and over again in the workplace or anywhere else we have contact with others. Even those sad souls who have to work on the weekends can be heard saying, “Monday (or insert day here) is my Friday! !” Yes, we American’s love our weekends. Like everyone else, I always look forward to having a couple of days off (unless I have to work Saturday- boooo! )- and receiving a check every other Friday- but I also look forward to a couple of other things that have become Friday traditions: Food-Issue Friday here at the Card Chop and Movie Nights. Unfortunately, those two traditions have been lagging here of late. How times have changed since the days these two MSA Discs showed up with your favorite popcorn. If I wanted to watch a movie back then, it was more-or-less either on cable or at the theatre. Sure, video stores could be found, but they weren’t nearly as ubiquitous as they would soon become. Today, my wife and I watch our movies primarily at home by streaming through a little box called the Roku, or we pay a visit to the nearest Redbox. Like it or not, the hobby has also changed a lot since the mid-late 80’s. 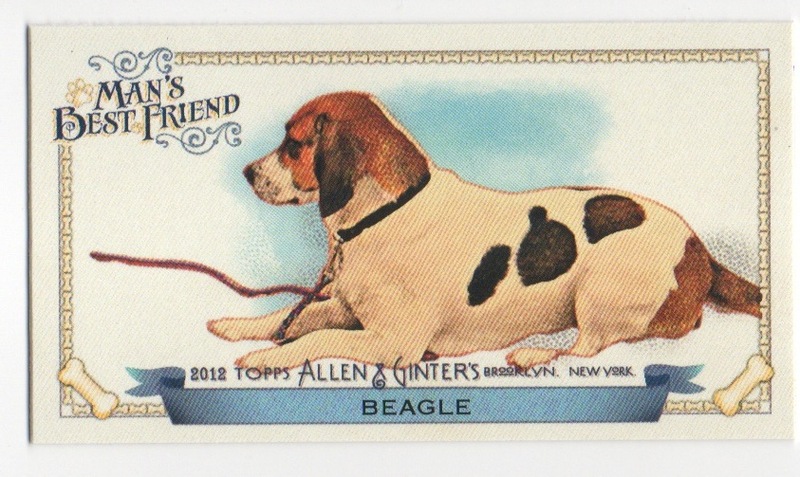 Cards and discs such as these are no longer distributed in food products like they once were; and, just as video content has moved more towards the digital world, card companies are also beginning to experiment in the digital realm. 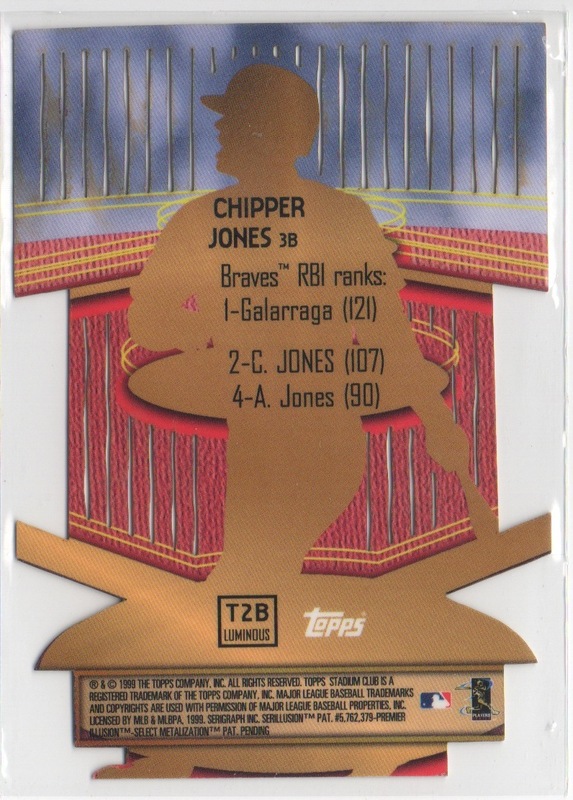 Topps’ Bunt app is extremely popular- but will it replace actual physical cardboard? Let’s hope not. One thing that the internet has affected: the LCS. Like the video store, there’s much easier (and cheaper) ways to buy product today. And while it’s still possible to find a card shop (and video store! ), they aren’t on every corner in every town. What I love about the designs of the two series represented here is the incorporation of baseballs on the ’88 release and the ’87 set made to look like a baseball. While the ’87 design seems to have been done before, it still works really well. Another great feature on the ’88 is the circular design and its inclusion of the balls, product name and edition. The pennant and its sharp cuts is also a nice inclusion. The back of the ’87 is pretty meh, with a look that has been overused on MSA products. Our local minor league team (the Boise Hawks) recently ended its decade-plus affiliation with the Chicago Cubs. It’s rather unfortunate because we’ve seen a number of top-tiered prospects roll through Boise over the years, due to the Cubs good scouting department (too bad for Cubs fans that hasn’t translated into wins at the major league level). Saying goodbye to the Cubbies means that a new parent club is in place: the Colorado Rockies. Geographically, an affiliation with the Rocks makes perfect sense. The only major league team closer to us is the Mariners, and they already have a team in the Northwest League. But to be honest, I just haven’t encountered any Rockies fans. Denver Bronco fans- yes (there’s an abundance of them here), but no one sports the purple and black around here. I may not be a Rockies fan, but I do have a few cards in my collection of men a man who wore the black and purple. 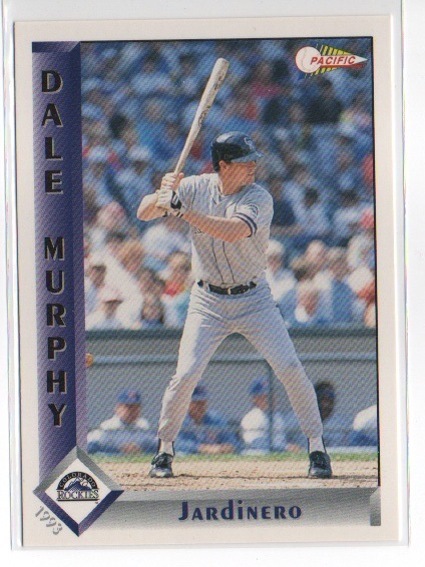 In fact, the latest addition to my Dale Murphy collection features Murph wearing the uniform of the team in its first year. 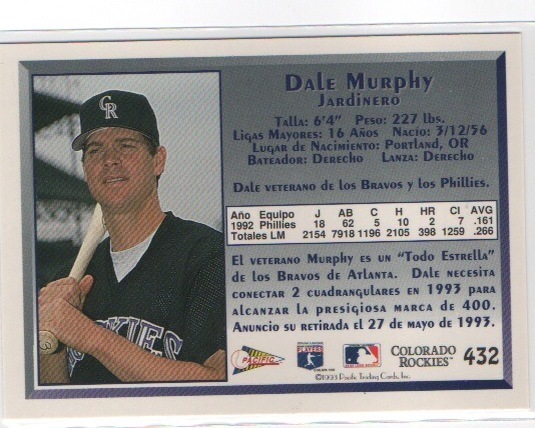 The 1993 Pacific Spanish edition card (#432) is one I hadn’t even been aware of until about a month ago. Needless to say, I had to snag it as quickly as possible. 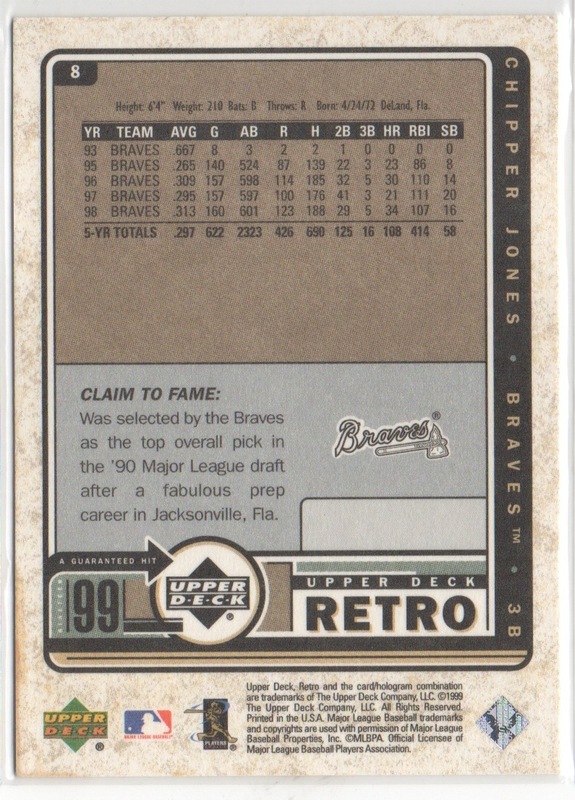 Now, if only Topps would include a similar card in one of its ‘retro’ designs. When you’re a fairly focused collector and working with a pretty small card budget the last thing you want to do is pull off an impulse buy. I can say with pride that very rare is the occasion when I do such a purchase. And when I do, it’s usually a couple of packs from Target. 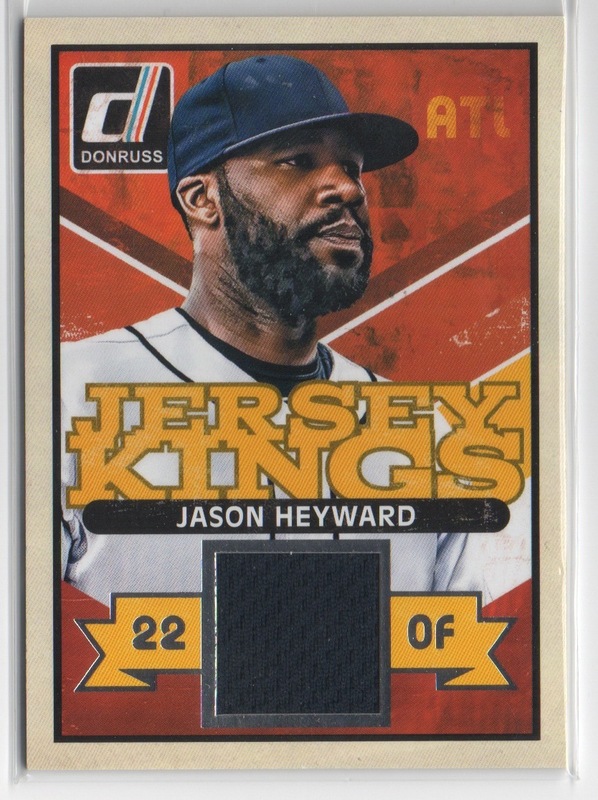 Today’s card was the result of an evening on eBay recently, where I saw this Jason Heyward Jersey King with the opening bid of 49 cents and no bidders. For that low of a price, why shouldn’t I bid on it, I asked myself. 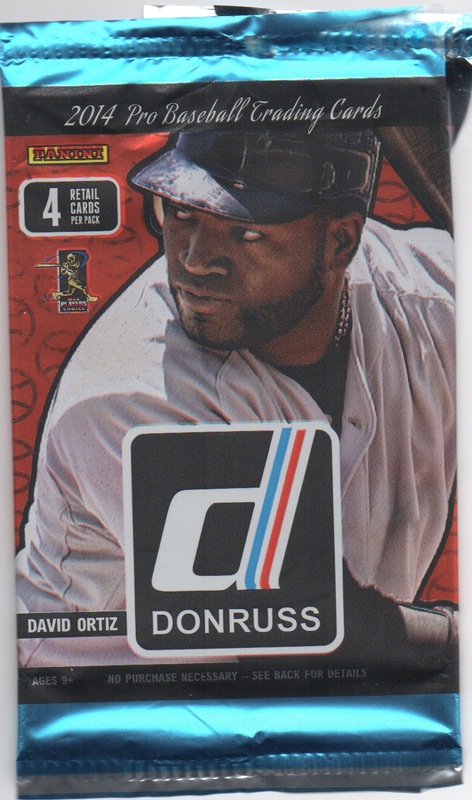 Well, 1) I don’t collect Jason Heyward and 2) I’m trying to stay away from Panini products (except cards of those who I collect). 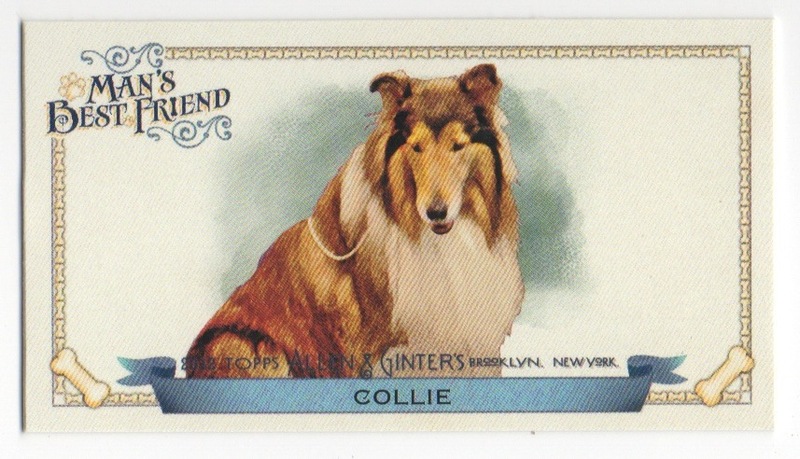 Well, I just happen to bid on it- I mean, it is a pretty sweet looking card. 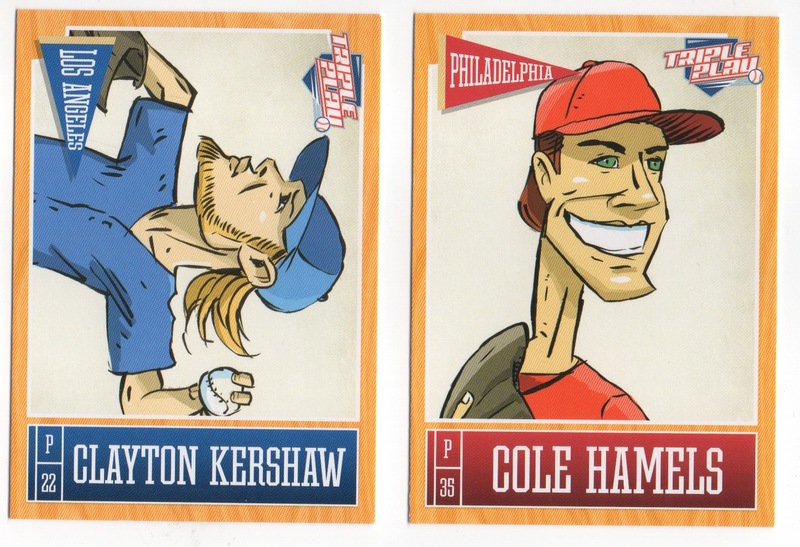 And let’s face it, these cards are about as close to oddball cards as you’ll find these days- and I loves me some oddballs! 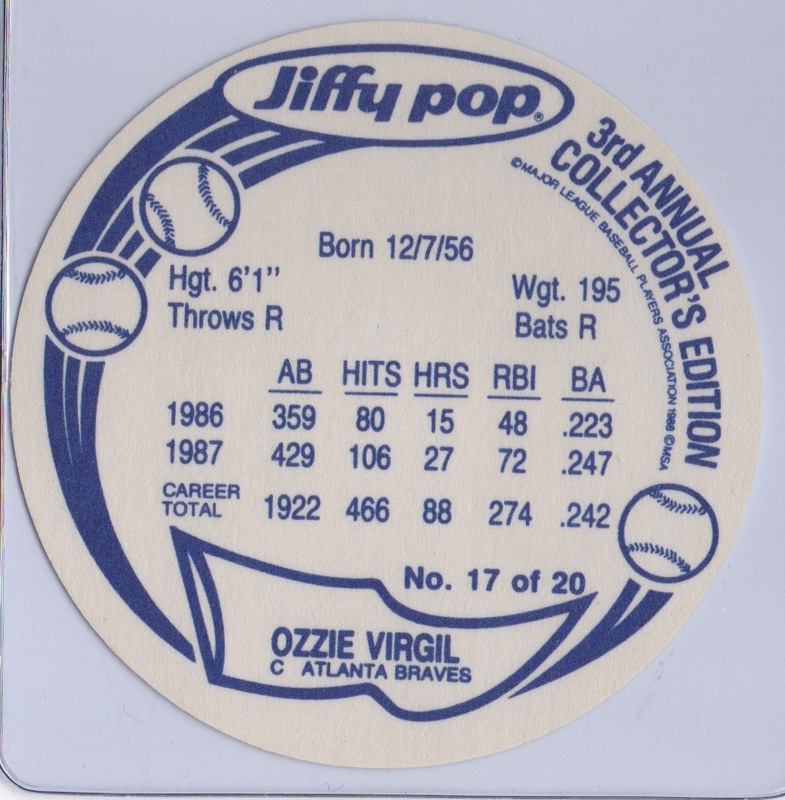 So I’ll either keep it in my oddball collection or the Braves will sign JHey long term and I might just have to begin collecting him. 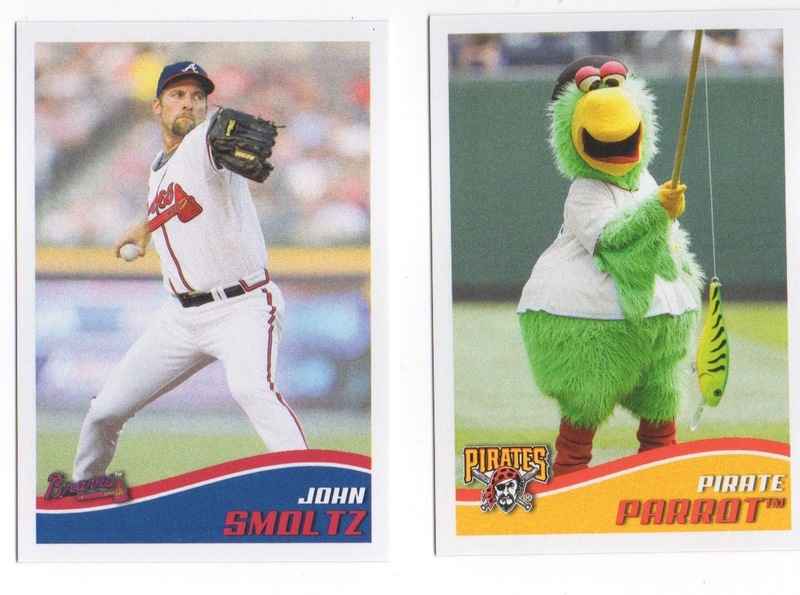 Cards from the early 1990s are often maligned by us collectors- and for good reason. The designs were terrible more times than not and the print runs…well, they were higher than our national debt. That being said, there are still some gems out there and, believe it or not, they might just be solid investments (if you care about such a thing- I certainly don’t want to pay top dollar for something that I can get for pennies on the dollar later on, but I digress). 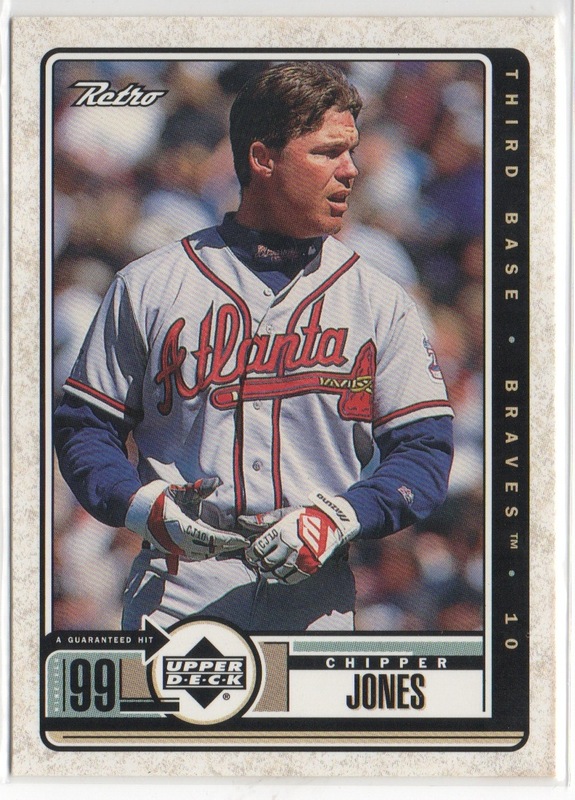 From the day he was drafted I put a lot of stock into Chipper Jones. Not necessarily monetarily (although that would eventually happen in cardboard)- but hope. He was going to be the savior of a sorry franchise and, as time would tell, he turned out to be pretty good. When I re-entered the hobby in 1991, I began collecting his cards- both the major league releases as well as his minor league cards. I think it’s safe to say that at one time I had most of his minor league issues, with the exception of the 1992 Durham Bulls team issued set. Unfortunately I dumped them when I got out of the hobby for a few years in the early 2000s. 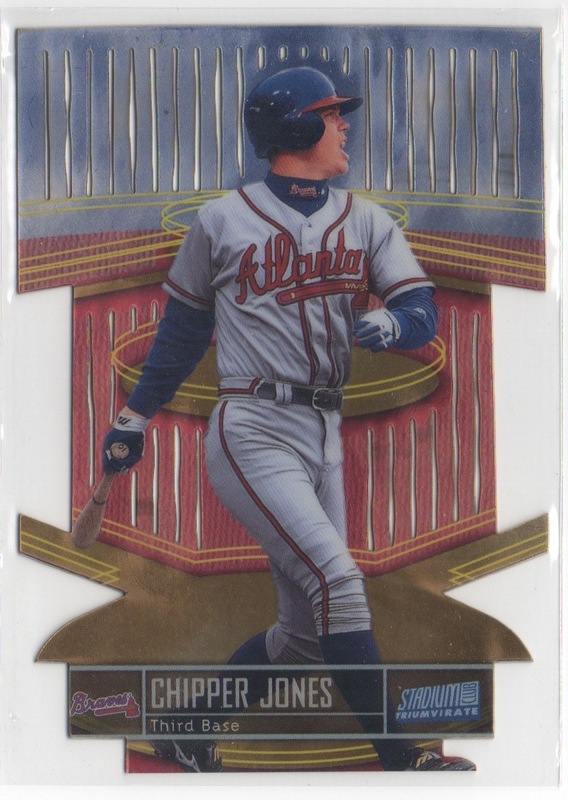 One card I’ve really wanted to reclaim is the 1992 Classic Best Durham Bulls team set #1 card. I recently picked up not only this card, but the entire team set, for $8.50 on the ‘Bay. It’s quite simply one of the most perfect cards you will find. Let’s take a look, shall we? You have the classic pose of a hitter waiting to unleash his baseball fury- destroying the ball and crushing the hopes of his opponent. Only this photo is taken down the right field line. Look at that face: it exudes focus and determination. He will make it to the majors. Durham Athletic Park, former home to the Durham Bulls. There’s nothing like minor league parks, and most can’t hold a candle to the one made popular from the movie named after the Durham, North Carolina team. I get tired of advertising infiltrating itself into every aspect of our lives- but I will never tire of advertising on the outfield fences of minor league parks. Gotta love it when players or coaches find their way, unintentionally, onto cards like this. We call this a photobomb in today’s vernacular. Has anyone started a mini collection of cards featuring these innocent bystanders? While goofy names and logos have been the style du jour for minor league baseball the past twenty years now, the Durham Bulls have maintained the classic look. I had one of these burnt orange caps a number of years ago and am seriously thinking of getting another one. I think I have previously lamented about the fact that, other than a very short time period during their younger years, my two sons never showed much interest in card collecting. Ours is a hobby that I had wanted to share with them, but they were never huge sports fans- I guess you can say they were more of casual fans (very casual). 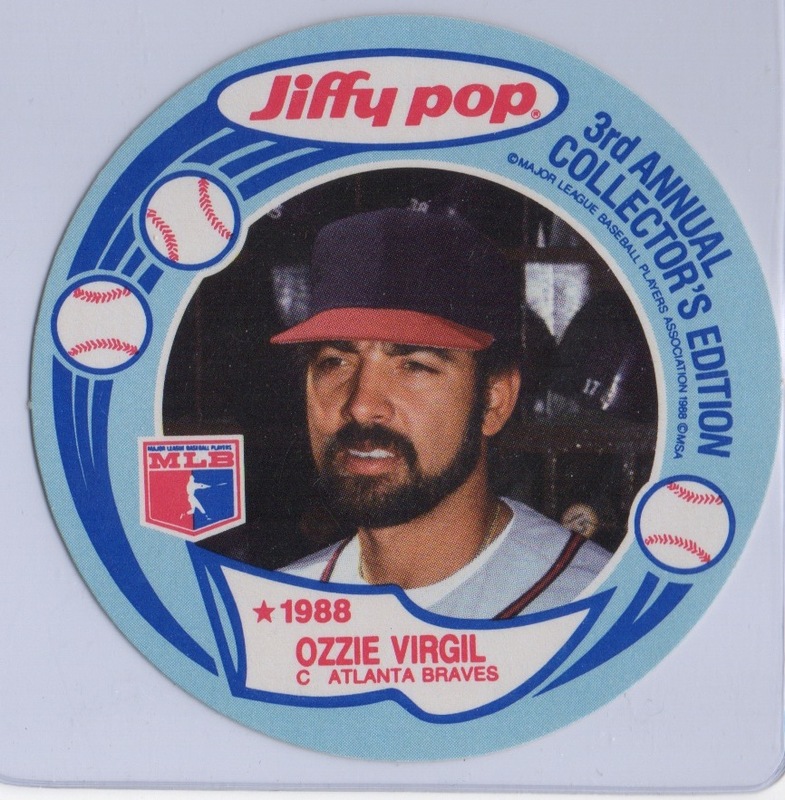 Each had a small collection of football cards, and my oldest had a few Mark McGwire cards, but that was about the extent of their collections. My daughter? Pfft. She’s not a sports fan and I never even gave a thought to trying to get her interested in the hobby. My daughter may not like sports, but she loves animals. Especially dogs. 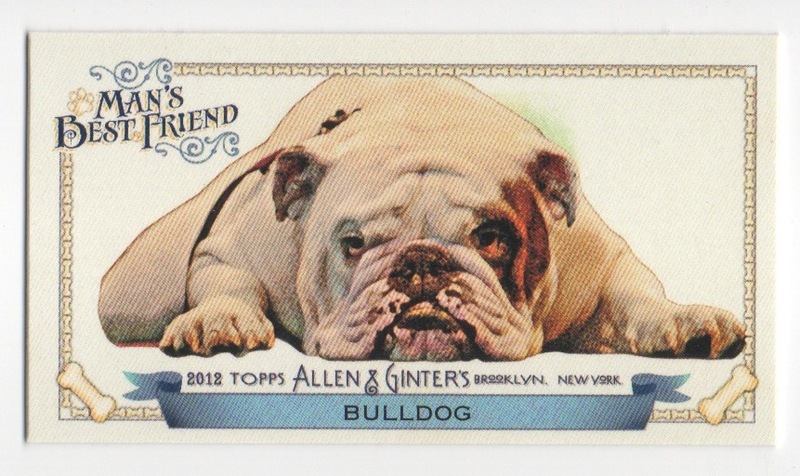 And so, taking that interest of hers and trying to find something we could enjoy together, I proposed the idea of putting together the 2012 Allen & Ginter’s “Man’s Best Friend” insert set. She joyfully agreed. Our favorite shot out of the group. The ‘pouty’ look never gets old. The first four cards towards this set put me back twenty-five cents; not too bad, even with having to pay $1.93 in shipping. 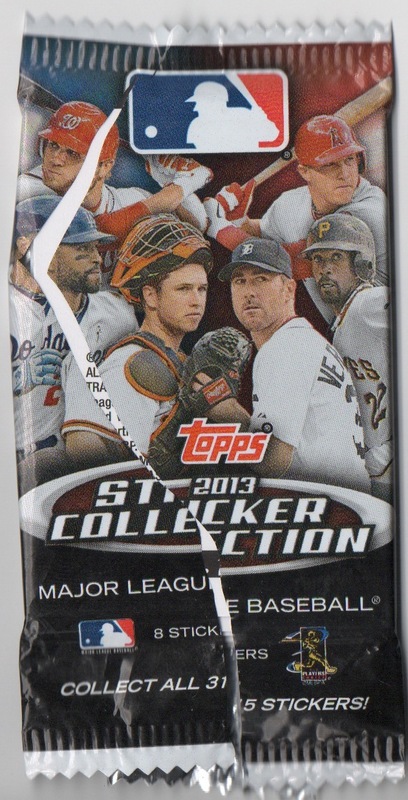 Now, I’m asking for the help of my readers: Do you have any cards from this set that you’re willing to trade? If so, please leave a response- telling me what you’re interested in. Thanks! I’ve found myself facing somewhat of a collector’s dilemma. Do I add another player collection or continue with my current interests. I know- first world problems, right? So I’ve asked myself, “do you really need another player to chase after?” Truth be told, no. No, I don’t. I need that as much as the Braves need another all-or-nothing hitter. Another bad contract like Uggla or BJ Upton. Or another arm to be lost to Tommy John surgery. Why, then, do I feel the need to add another PC? I honestly can’t offer up an explanation. Fed up with the current team, the current card industry, feeling nostalgic. Probably an amalgamation. 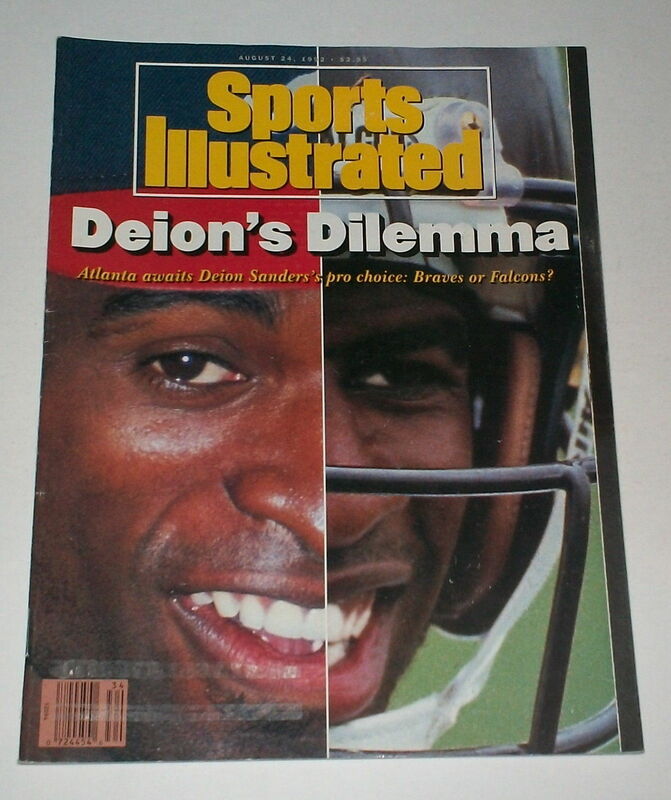 Back in the early 90s, I was a huge Deion Sanders fan. I mean huge. I had the Deion Braves jersey and the Deion Falcons jersey. I had the Diamond 2 Turf “You Gotta Believe” shirt- and if I could have gotten away with it, I’d prolly have had the jheri curl look. The do-rag…nah, I’d have probably looked like Kip on Napoleon Dynamite. Hey, a guy has to draw the line somewhere! When the Braves went all Sid Bream on the Pirates to win the Pennant in ’92, I gave a Kobe Bryant Michael Jordan fist pump as Prime Time dumped a bucket of ice water on Tim McCarver like they were doing the ALS ice bucket challenge. When he posted ridiculous numbers in the ’92 World Series, I anointed him the next Bobby Bonds. When he was traded to the Reds for Roberto Kelly (are you kidding me?! )…I saw red. Unfortunately (or, fortunately, depending on who you ask), the man was all about himself and not about the team; ‘me-first’ guys don’t last very long in the Braves organization. Just ask Kenny Lofton about that. 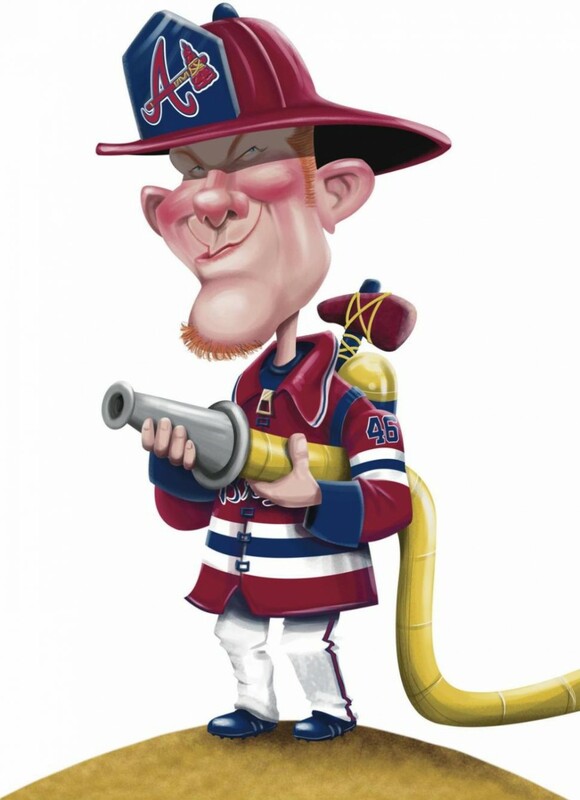 And while the brass might have gotten tired of his schtick, he was very popular with teammates. 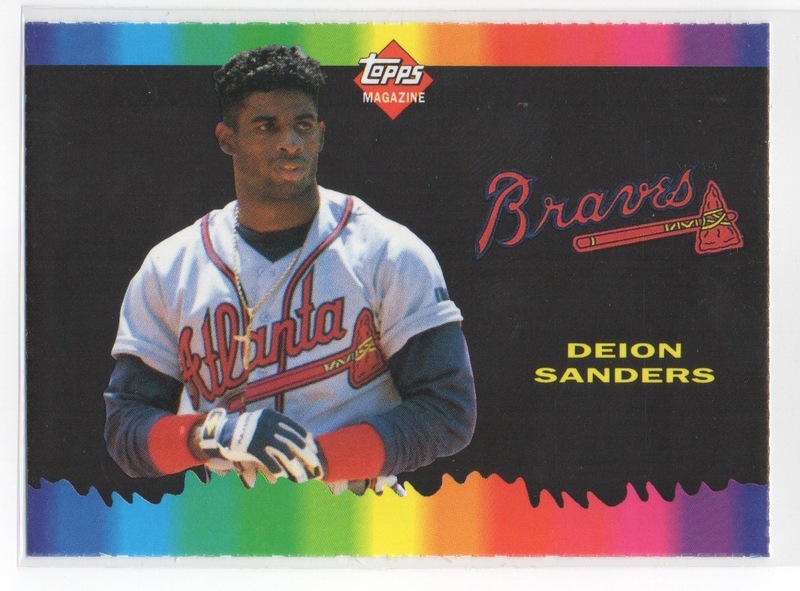 So, why would I consider collecting Neon Deion’s cards (at least, as a Brave)? Well, the guy was just so fun to watch on the diamond (not to mention, on the turf). Forget for a minute that he was a Prima Donna and try to remember him exploding out of the box, stealing a base, or legging out a triple on a ball hit into the gap. The two cards featured today are recent purchases- not with the intention of going into a Deion collection, but for my oddball/food-issue/regional box. Maybe I’ll have to reconsider where these two oddballs call home. We took our daughter to see How to Train Your Dragon 2 on Tuesday night. Before heading over to the theatre, however, we made a quick stop by a nearby Dollar Tree, wasting time, if nothing else. While there, I scoured through their dollar packs- hoping to find something worthwhile. There was nothing I could live without- but I did settle on five packs of stuff I normally don’t even look at. But for a buck each- sure, why not? Believe it or not, I didn’t rip the packs immediately. In fact, it took me a while after we got home to even think about the newly acquired cardboard houses. Shortly after the previews began in the theatre, my wife’s phone buzzed. Her dad. She decided not to answer it. Having a somewhat unexplainable, uneasy feeling, I told her to take the call (I thought it would be about her grandfather-who’s 91 and just lost his wife). She said she’d wait for a voice mail. It didn’t show up, but my phone then buzzed. Immediately I left the theatre for the lobby and answered the call. Two things don’t mix well: crowded theatre lobbies and a person who doesn’t hear very well on cell phones. I was having difficulty hearing just what my father-in-law was saying, but two words stopped me in my tracks. Sue’s dead. After that was more confusion and I told him I’d have my wife call him back. As it turns out, my wife’s dad and step-mom had taken their granddaughter on a chartered flight. For reasons still unknown to us, the plane crashed in the forest near a winter recreation area. Three survived; my mother in law didn’t. Our niece is in a burn unit, receiving treatment for the injuries. My father-in-law has been released from the hospital, but not without what will surely be scars- both external and internal. No word on the condition of the pilot. After arriving home that night, both my wife and I worked our phones- she, talking to family and me notifying friends and family, requesting prayer for their family. 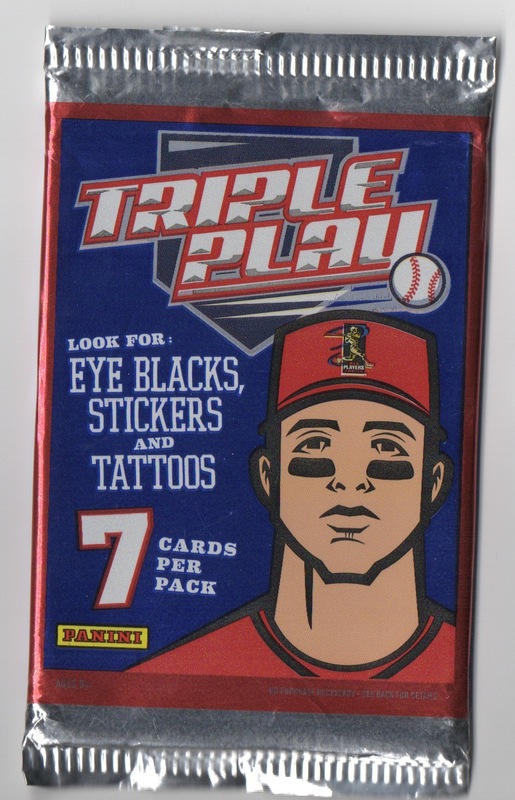 Once done, I sat at our kitchen table, looking at the packs of cards I had purchased. As my mind was still trying to process the events of the day, I thought about how insignificant my earlier purchases are in the grand scheme of things. And yet, I remembered how they can also serve as a diversion, and I decided to open the packs- hoping that for at least a few minutes I could escape the horrors that had befallen my wife’s family. 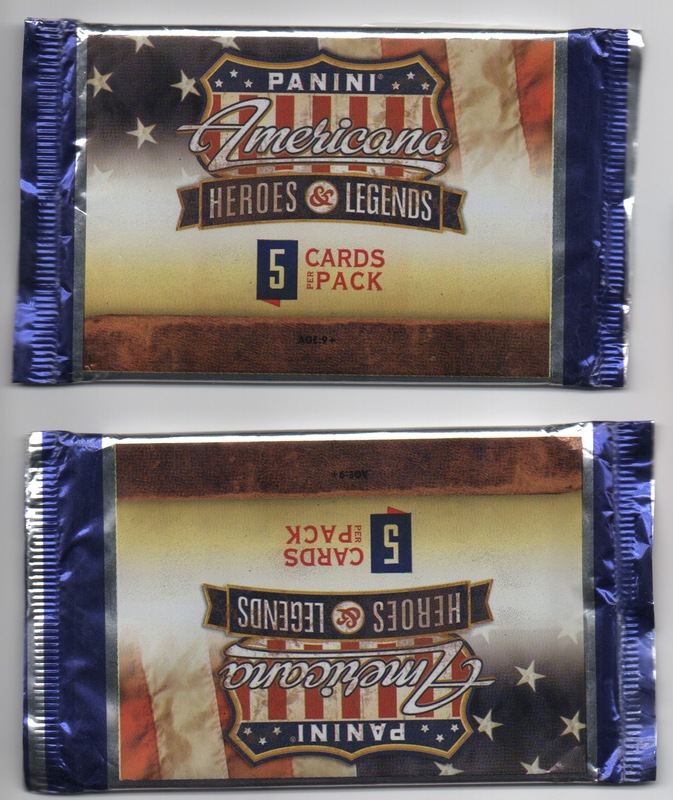 I decided to open the two Americana Heroes & Legends packs first. I knew nothing about these cards but thought it was more of a pop-culture type of set (I had ignored the second part of the set name). 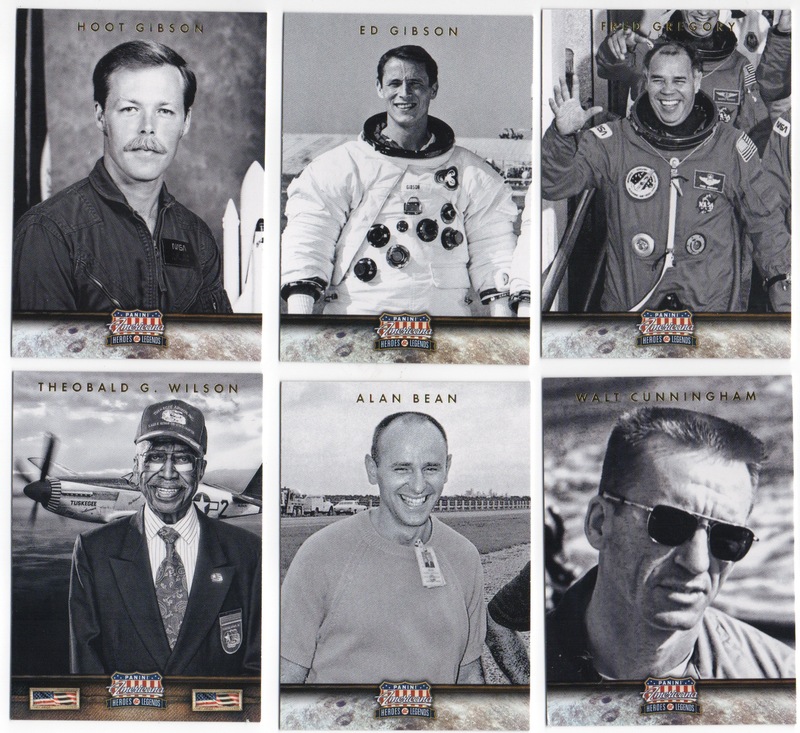 Of the 10 cards, six were of astronauts and airmen. So much for a diversion. That’s right, Cole, mock my team’s weak, anemic offense. You may have pitched a no-no, but Kershaw is still the man to be feared. YES! A NEW SMOLTZIE FOR MY COLLECTION. Oh, a funny one to try and cheer me up. As I said earlier, our hobby is a great diversion from the trials in life, but that is all it is: a diversion. The sadness and questions of how and why were awaiting me just minutes later; the joy of opening the packs- as short as life itself. They say that food plays an important part in the pagan festivals- of which there are eight. I don’t know much about the festivals nor the rituals- and I don’t really care, either. What I do care about, however, is cardboard. 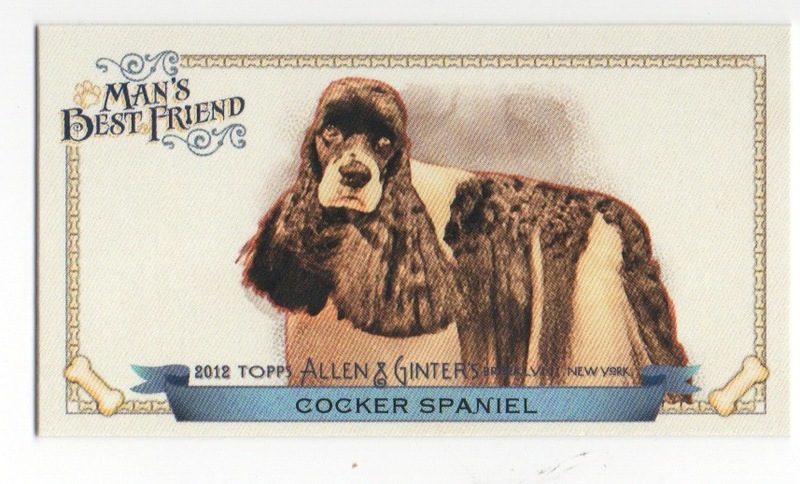 And I have a particular fondness for food-issue cardboard, such as today’s featured card. Before we begin, however, I want to mention another part of ancient pagan culture: the…um…*face blushing*…orgies. This practice was about the cult of fertility and the gods associated with the cult. The participants thought that by copulating on the ground, the fertility of the soil would improve, ensuring good harvests. I don’t know if the practice is still going on in modern neopagan cults or not, and the only thing even remotely close to these orgies in our modern day that I can think of would be the ‘swingers’ and wife-swappers of the 70s. I can’t help but think that upon his arrival in the Bronx Zoo, Dave Pagan felt as if he were in a completely different world. Originally from a small farming community in northeast Saskatchewan, Canada, Pagan arrived in the major leagues in July of 1973- just months after Yankee starting pitchers and roommates/best friends Mike Kekich and Fritz Peterson announced they had swapped wives families during the 1972 season. While Kekich was no longer with the Yankees by the time the small-town boy arrived in New York (he had been traded to Cleveland), it appears that many fans didn’t know the free spirited Kekich had left town. Pagan was given the former Bomber’s number 18 to wear, and because the team didn’t place the players’ last names on the back of the uniforms, many fans mistakenly thought he was the wife-swapper- and let him hear about it, too. The Yanks eventually dealt the Canadian righty to the Orioles in the 1976 mega-deal which involved Rick Dempsey, Tippy Martinez, Rudy May and Scott McGregor for Ken Holtzman, Doyle Alexander and three other players. New York, looking to make the postseason for the first time in more than a decade, sought after veteran pitching and Holtzman had plenty of postseason experience with the Oakland A’s during their glory days (although manager Billy Martin never used the lefty during the ’76 postseason. Holtzman watched from the bullpen). 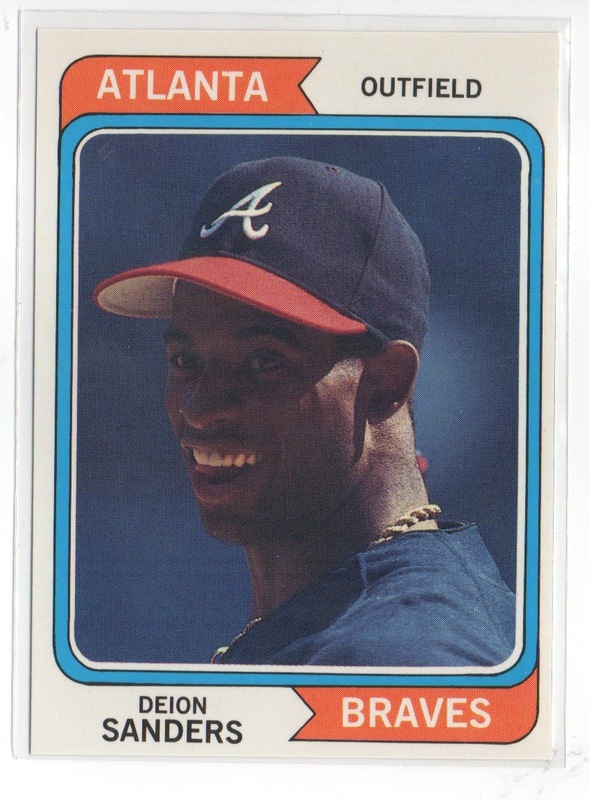 Baltimore left Dave unprotected in the major league’s expansion draft following the ’76 season, and he was drafted by Seattle in the 29th round- bringing him back to the area where he played college ball. Dave’s time in the Emerald City would be short lived, however. In High and Inside, the memoir of Seattle’s first-ever GM, the late Lou Gorman, Pagan is mentioned as a pitcher whom Pittsburgh GM Pete Peterson coveted. The Pirates were contending for the N.L. East title with eventual East champion Philadelphia Phillies and were looking for a veteran pitcher who could help the team in their stretch run. Without much time to agree on players, the two executives agreed that Dave Pagan would go to Pittsburgh for a player to be named later. 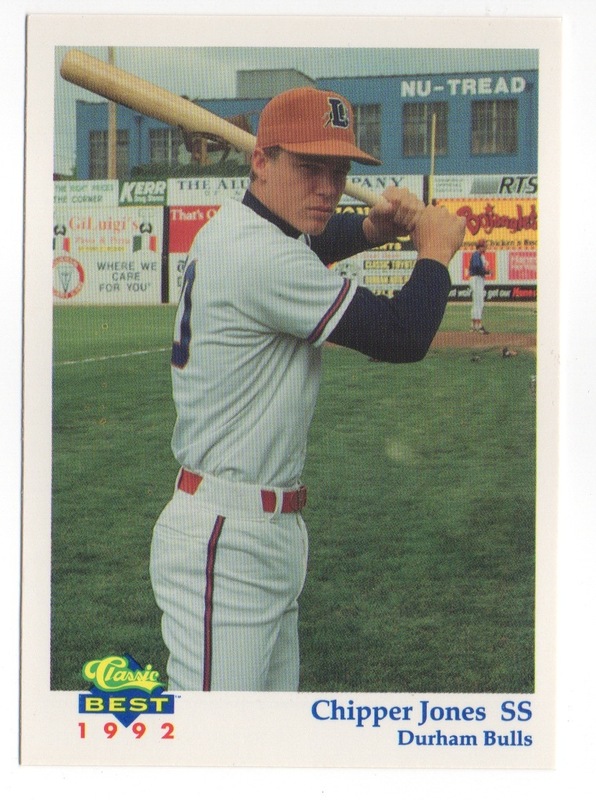 That player turned out to be Rick Honeycutt, who went on to a pretty solid career. 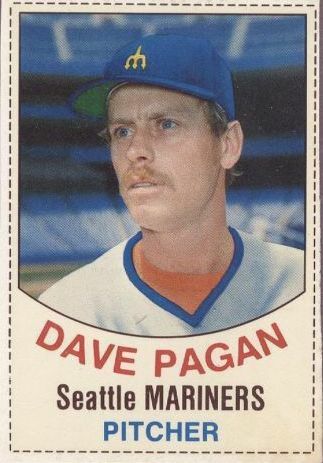 Pagan, unfortunately, only had one more major league game in him- throwing three shut-out innings against the Mets on July 27, 1977. I consider myself a morning person. And a night person. Truth be told, anytime that is quiet and I have solitude…that is the time I enjoy. Give me a cup of coffee, something to read, and I couldn’t be happier. Today’s card was the result of an early morning email alert I received from the ‘Bay. Like I said, mornings are good. I woke up around 4:45 one morning a couple of weeks ago. Now, I normally don’t get up until 5:00-5:30, but I was going into work at 6 that morning (meaning leaving the house about 5:45) and wanted to give myself a few extra minutes. As I was getting that first cup of coffee and my breakfast, I checked my email- and I’m glad that I did. Not too long before I awoke, eBay had sent an alert for a newly listed item that I had saved in my searches: a 1979 Hostess Bob Horner card. 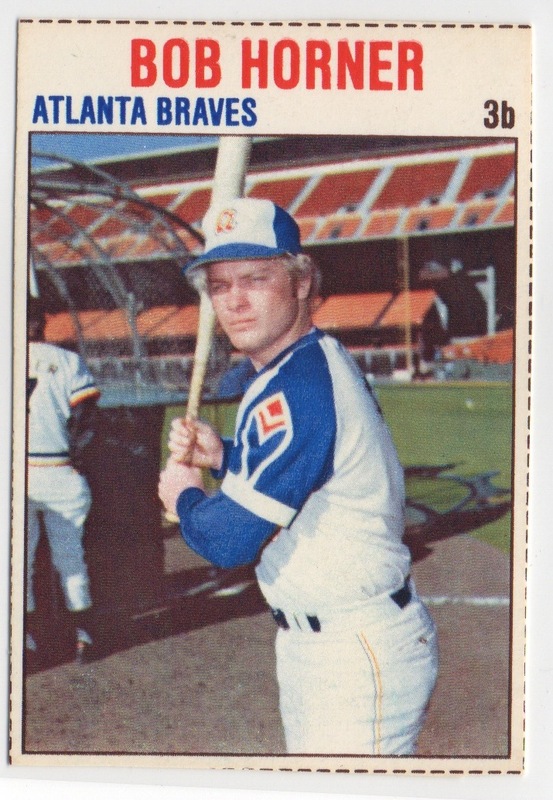 Horner’s rookie card, of course, was in the 1979 Topps set and, unlike certain publications, I consider oddball’s like this one to be a rookie card as well. 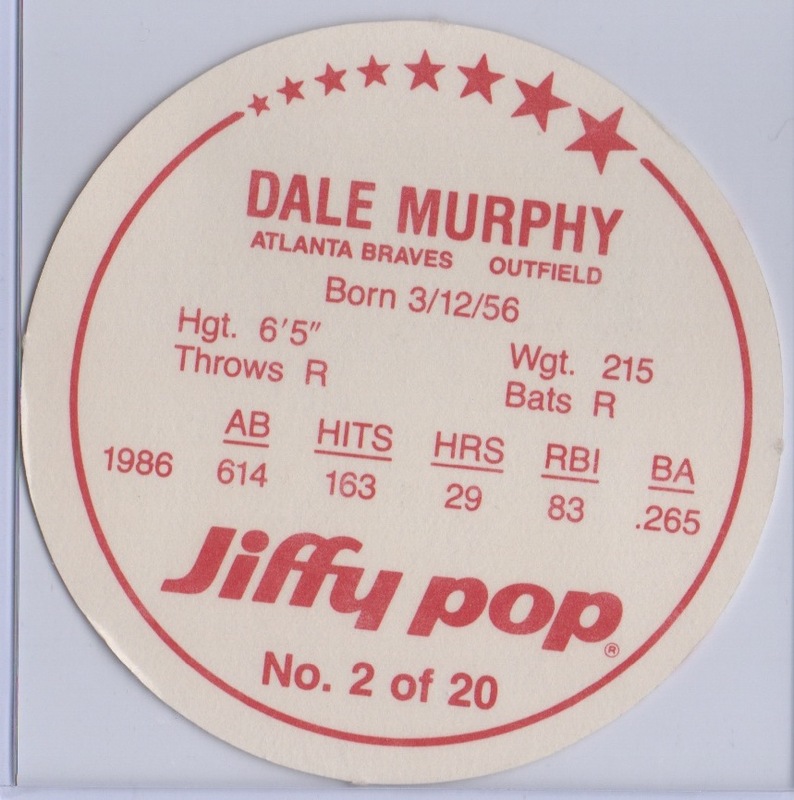 I recently got the ’79 Hostess Dale Murphy for my birthday and knew I just had to pick this one up immediately because they’re not that easy to find. The asking price was (what I thought to be) a modest $3 and so I bought it quicker than you can say “Dunkin Donuts” (coffee, that is). The photo looks like it could have been from a ’77 Topps card- can’tcha see it?